Years ago women planned extensive spring cleaning projects. Often this included the airing of their quilts after a long winter of use. 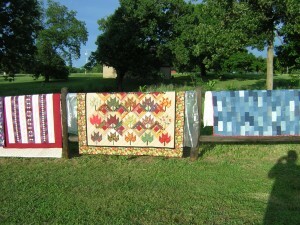 QUILT has continued this tradition by bringing our quilts to the “Airing of the Quilts” held each spring. We bring our quilts and share a potluck supper. Not only are our members great quilters, they are also great cooks! At the picnic, we get together to share great food, awesome old and new quilts, and in general just have a good time. This is an open meeting, all are welcome. After we eat, we look at the quilts and share the story of each quilt. Please join us. Springtime means that its time to air out those quilts!